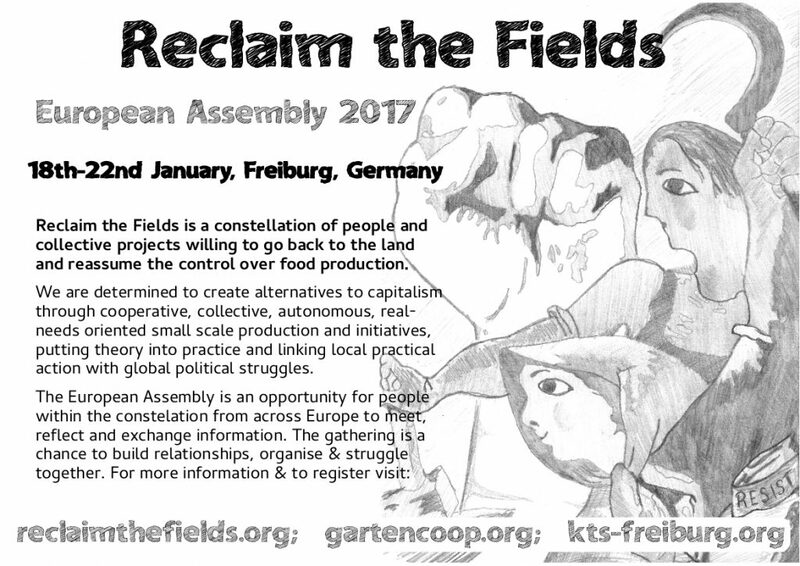 You are invited to join the European assembly of Reclaim the Fields 2017, which will take place in Freiburg-im-Breisgau, Germany, between 18th and 22nd of January 2017. The meeting will be hosted by the community-supported agriculture project Gartencoop and will take place in the autonomous center “KTS”. The assemblies happen every year during winter. Generally they bring together people active in RTF constellation, but everybody is welcome. to have fun and build relationships between us! The last European Assembly happened in January 2016 in Warsaw, Poland, and was hosted by the Radical Allotment Gardens, the Polish RtF star. You can check the last Reclaim the Fields Bulletin here. If you or your group will join the assembly please fill in the Registration Form. This is very important for the people that do the organisation, so that everything will be prepared good when participants arrive. If you have any suggestion for the program, there is a special place in the form where you can let us know in advance about it. This year the assembly takes place in the so called “green-city” of Freiburg, Germany. The very contradictory ecologists-capital was strongly part of the uprising anti-nuclear movement, which started by empeaching the construction of a nuclear-plant at Wyhl in the 70’s. But even if throughout the 80’s a militant ecologist, squatting, feminist and antagonistic movement played an important role, social movements decreased progressively, like in most western-european towns, after the wall came down. In our days, the 220.000 inhabitant city still has a big amount of alternative institutions and projects, for example in left media (rdl.de, cinerebelde.org, linksunten.indymedia.org), housing (syndikat.org, schattenparker.net), antira-struggle (aktionbleiberecht.de, iz3w.org, freiburger-forum.net) or alternative food-production (gartencoop.org, lebensgarten-dreisamtal.de, luzernenhof.de). But the “green rebels” from the 70’s are in power, in Freiburg and in the region, and keep cultivating the lie of green capitalism. They are bright actors, within the neoliberal and repressive evolutions we live in. The people welcoming you are involved at the 300-household agricultural-cooperative GartenCoop as well as in different of the abovely named struggles. The social/autonomous Center KTS Freiburg exists since the mid-90’s and has been legalized about 18 years ago. The biggest part of the meeting will take place at the center – some of the program might be visiting farms and projects in the surroundings. We’ll shurely spend time at the asperagus, strawberry and corn-dominated countryside as well – and there is the black forrest in walking distance for walks and talks. We expect to start the meeting on 18th of January after lunch. The social center that hosts us it is booked from 17th to 22nd of January, so it would be good if you can arrive on 17th or the latest on 18th before lunch. We would like to invite you to take part in the facilitation of some sessions. If you are interested you can join the facilitation meeting which will take place on the 18th at 10:00am. In Freiburg Bus no 11 and Tram no 5 (better) stops at “Pressehaus”. The KTS finds itself behind the railway-bridge above the main road, just take the stairs to your left behind the bridge. Depending on the number of people, the accomodation will be decentralized. About 40 people could sleep at the KTS at most, others will stay at other housing-projects, wagenplatz or private flats. Accessibility for people with a disability is limited in the center. There are bathrooms and a medium-size kitchen, computer-rooms, screen-printing and a free shop. We will have vegetables from the cooperative-farms and other friends. Hopefully the baking-cooperative can make bread for us. Please spread this invitation to the stars in your region.